My name is Joe Darnell, and I am a bowyer from Oak Ridge, Tennessee. I have always been interested in the primitive and traditional ways of life. Over the years, I have enjoyed anything that causes me to get out into the woods to connect with nature. I enjoy flint-knapping points and blades, making cane arrows and quivers, hunting edible mushrooms, harvesting and eating wild foods, and more. But nothing satisfied the call of my Native American ancestory as much as building traditional bows. Bowbuilding has become my passion. Mastering the art of building traditional bows is a long, learn-as-you-go process that includes finding out as much about yourself as the wood you are working with. Every type of wood has its own personality, expectations, and limitations. Part of the fulfillment of building bows is learning the personality of the wood. You learn to work in tune with the various types of wood to produce a beautiful, functional work of art. 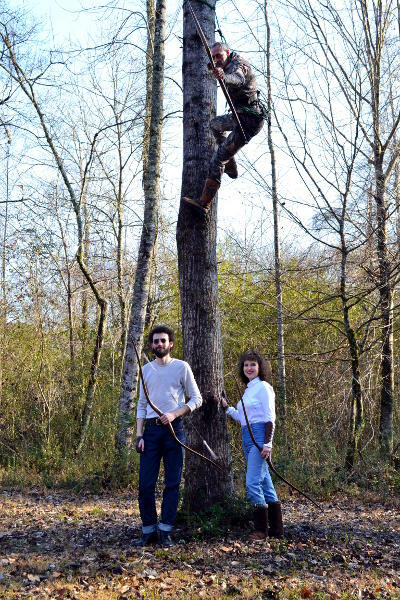 In this fast-paced world, nothing satisfies me more than taking the path that my Cherokee ancestors traveled years ago: taking my hand-made bow, quiver, and arrows and retreating to the solitude of the woods. It's the simplicity of you, the bow, and the arrow, all working as one. If you would like to contact me, please do not hesitate to email me. Please also consider following Tanasi Bows on Facebook and subscribing to the Tanasi Bows YouTube channel. © 2018 Tanasi Bows. All rights reserved.